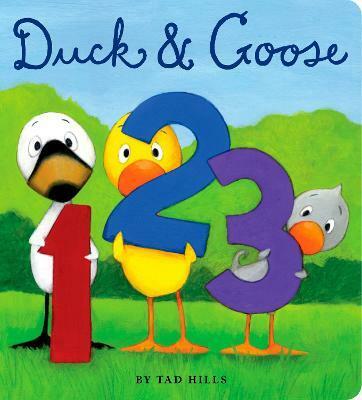 Learn basic counting concepts with the New York Times-bestselling odd couple Duck and Goose! All the favorite characters, including Bluebird and Thistle, return--this time to introduce basic counting concepts. One goose. Two ducks. Three friends. As the characters illustrate from numbers 1 to 10, children will love to follow along with the simple text and all-new original art. A small trim size and Easter egg-colored art makes this the perfect Easter basket stuffer for young children everywhere! And don't miss other books in the collection, including the picture books Duck & Goose and Duck, Duck, Goose, and the board books What's Up, Duck? and Duck & Goose Find a Pumpkin! Tad Hills is the author and illustrator of Duck & Goose--called "expressive" and "adorable" in a starred review from Kirkus Reviews--and Duck, Duck, Goose, both New York Times bestsellers. He is also the illustrator of Waking up Wendell by April Stevens. He lives in Brooklyn, New York, with his wife and two children.